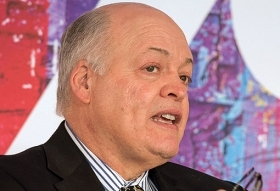 Ford CEO Jim Hackett: "We're simply reinventing the American car." Ford Motor Co.'s top executives on Thursday vigorously defended the automaker's plan to discontinue all of its North American sedans as a way to better meet customer needs by "reinventing the American car" rather than a retreat in response to falling sales. During the company's annual shareholders meeting, CEO Jim Hackett and Executive Chairman Bill Ford were questioned repeatedly about the decision to kill the Fiesta, Fusion, Taurus and all but a wagon variant of the Focus in the U.S. over the next few years. Critics have called the move to focus on higher-margin SUVs, crossovers and pickups short-sighted, saying the automaker is abandoning segments that remain popular with entry-level buyers. The company has said that utility vehicles and pickups will represent roughly 90 percent of its mix in North America by 2020. Only the Mustang sports car and upcoming Focus Active wagon will remain in Ford's car portfolio, although the automaker has said it will continue to add to its lineup with vehicles in multiple segments and price points that offer more cargo room and better fuel economy. "We don't want anyone to think we're leaving anything," Hackett said. "We're just moving to a modern version. This is an exciting new generation of vehicles coming from Ford." Ford Motor has been less clear on its plans for the sedans in the lineup of its Lincoln luxury brand. Hackett acknowledged that uncertainty Thursday but said only that the Lincoln Continental, introduced in late 2016 after a 14-year absence for the nameplate, would continue "through its life cycle." He did not mention any plans for a new generation of the car. "I share your frustration. The whole management team does," Bill Ford said, echoing similar comments he has made in recent years. "Look, we want to get the stock price moving. The business can get fitter, and it will get fitter." Hackett again outlined his plans to cut US$25 billion in costs through 2022, detailed in the company's first-quarter earnings call last month. It was Hackett's first shareholders meeting since taking over as CEO last May after the board of directors lost confidence in Mark Fields' vision for the company. Bill Ford praised Hackett for his first year on the job. "In 2017 Ford Motor Co. took a major step forward to becoming the world's most trusted company, a company that can deliver real value for all our stakeholders," Ford said. "It started at the top, with the appointment of our new CEO. I believe Jim is the right person to lead us during this transformation time in the auto industry. He's a true visionary." Among shareholder proposals, voters again rejected an annual request to remove the Ford family's special class of shares. Ford said 63.9 percent of voters were against the idea, down from 64.4 percent last year.